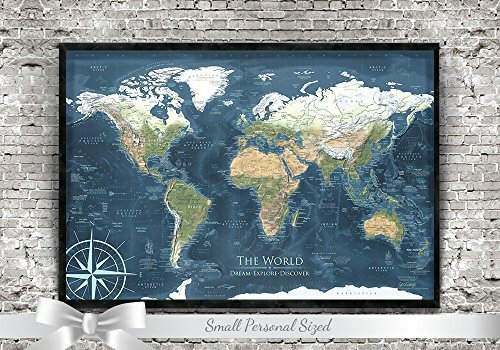 Push Pin Travel Map - 24x18 inch framed map - The Voyager 2 World Map - Designed by a Professional Geographer by GeoJango at HoldUp Art. Hurry! Limited time offer. Offer valid only while supplies last. The VOYAGER 2 WORLD MAP - a sophisticated map featuring extraordinary details! The map features our award winning terrain modeling of the Earth. The VOYAGER 2 WORLD MAP - a sophisticated map featuring extraordinary details! The map features our award winning terrain modeling of the Earth. Printed on satin paper and mounted to Gatorboard. Geography is the essence of understanding how we are connected by culture, history, civilization, commerce, nature, and the environment. This map is filled with thousands of details about our planet and is designed to encourage further exploration. For customized orders, a proof will be provided for your review, typically within 48 hours. THE MAP IS A DELIGHT TO RECEIVE! Includes a fun guide on how to get started with the map. Thank you for your interests in my maps! If you have any questions about this product by GeoJango, contact us by completing and submitting the form below. If you are looking for a specif part number, please include it with your message.